This week we're having a card challenge and it's the premiere of our card guest designer this month, Kim! 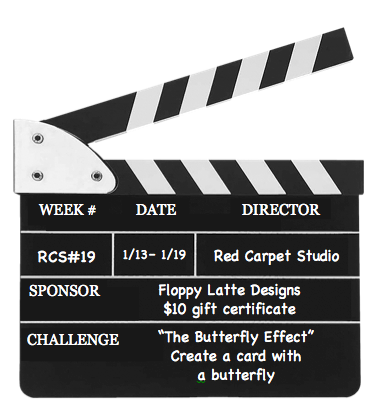 This week's challenge is inspired by the 2000 movie, "The Butterfly Effect" starring Ashton Kutcher. Even though spring is still weeks away, we thought we'd help brighten those winter blues with a fun, spring-like butterfly challenge. This week's card challenge is to include a butterfly on your card. Our fabulous sponsor this week is Floppy Latte's Digital Designs! One lucky, randomly chosen winner will receive a $10 gift certificate to their shop. The solid paper is from Tim Holtz & Ranger Distress Collection Pad. The pattern paper in the center is from MME Lost & Found. I did use the Swiss Dots Embossing Folder in my Cuttlebug. I also have a EK Sucess Butterfly punch. It is a layering punch which gives the butterflies dimension. 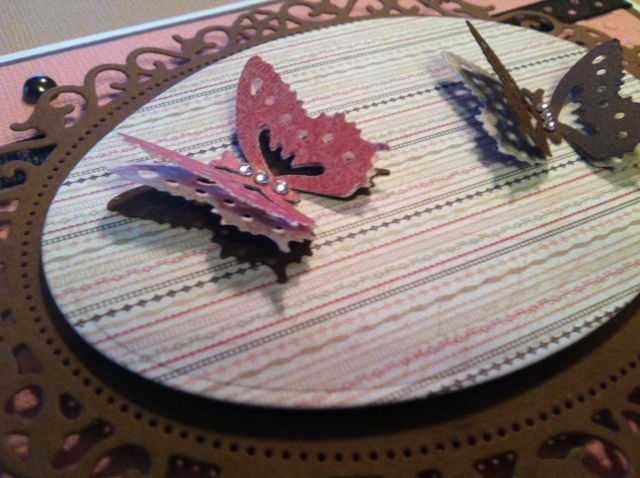 I placed the butterflies on the ovals which I made from my Spellbinders Nestabilities Petite Ovals Small & Floral Ovals. 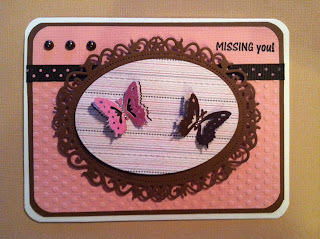 The sentiment is from Cardz TV It's All About You stamp set. I then finished the card with some bling and ribbon!! On a personal note I wanted to let you know that we have been house hunting for the past month and it really has taken away from my crafting. Finally after all the searching, we have found a house!! Yeah!! Our offer has been accepted and we just had a home inspection done yesterday. This week we will get the house appraised. If all goes well, we should be moving the first or second week of February. I really have not even begun to pack, so these next couple of weeks I will be busy with the packing. April and I went yesterday to pick up more boxes, so I have no more excuses and have to get packing. I'm hoping my blog will be back to normal by the end of February. I have been thinking of a couple of new things that I'll be doing on my blog, so please be patient and I promise to be back on a regular basis soon!! What a gorgeous card, Tara!! I love the design and the beautiful butterflies!! The colors are fabulous!! This is such a pretty card. I love the butterflies. Very pretty card! Wow, congratulations on your new house; I think you'll be very busy over the next weeks! Hang in there. such a sweet card and I am so glad I saw it so I could use the card made this morning. Beautiful card! Congratulations on your new home. I so love your butterfly card!! Those 3d butterflies are just beautiful. The embossing, ovals, ribbon and colors are great. Awesome card. Love your butterfly card!!! always love your cards! So happy for you on your new house. Excited about the plans that you have for your blog. Can't wait til you share with us!! !